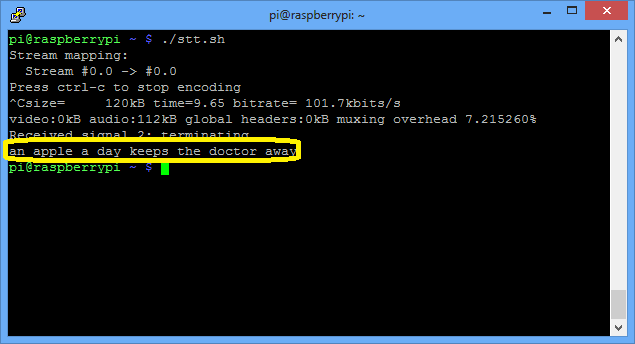 The hardware required is a Raspberry Pi with Internet connectivity and a USB microphone. 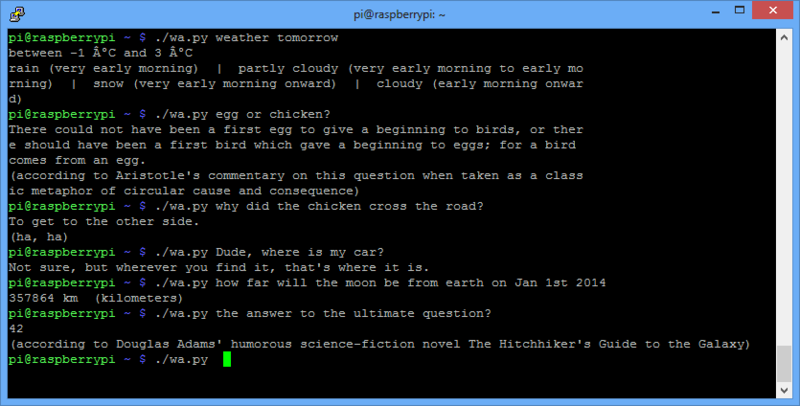 Pi is running the 2012-12-16-wheezy-raspbian image; I don’t have a USB microphone, but I have a USB webcam (Logitech V-UAV35) with in-built microphone, so that worked out fine without any driver installation. It work pretty good even with my bad accent. The output is saved to stt.txt file. Now onto the “brains” section, this is with no doubt a task for Wolfram Aplha. I used Python to interface with it, there is already a library to use. It is pretty easy to install, just follow the instructions in the link. I had to get an API key, which is a 2 minute task and gives you 2000 queries a month. print "I am not sure"
..you may need to “sudo apt-get install mplayer” first.. It sounds pretty cool indeed. So overall a fun project, maybe with some potential to use in home automation..
I’ve been experimenting with Google Voice recognition too, but found problems using a USB mic with the Pi (too quiet, even with alsamixer turned right up). The same mic works fine on Windows, which led me to discover some Google results that suggest recording audio via USB isn’t great on Linux. Did you have any problems in this area, and if so, how did you overcome them? I have to speak somewhat loud for this to work, but just high voice, not shout at it. I use a webcam’s mic, maybe I am just lucky that it is sensitive enough. I just put alsamixer to max and nothing else. Never mind the kids; I’m enjoying making the computer shout stuff at me! Hey now — this is fantastic! What a brilliant way to integrate all those services! I’m bookmarking this for dissection later. I have read all your post. I am having a problem at the first step only.Please help me. i have trawled the internet for these error messages but i just cant find the solution, any ideas? I know it doesn’t solve mplayer, but it is a work around to get you going. Hey! I keep getting that “bad fd number”-error in stt.sh, can anyone help me with that? Hello, I am having issues recording in with the speech to text. I am using a logitech C905 webcam with built in mic. Try ‘cut –help’ for more information. I assume this means nothing is being picked up from the microphone. I have verified that my user is a member of the audio group, I don’t really know what else to try before I buy a new webcame or usb mic. I am currently running facial recognition through opencv with the cam, and it’s working wonderfully, so I really don’t want to fiddle with a different camera if I can avoid it, and the arecord error makes me think it must be a configuration issue?